Hi there! I’m Tristina Eaton, the Marketing Director here at JessicaSprague.com. I am so excited to be here today to share with you a few things you may not know about JessicaSprague.com. But first, since this is my first “public” appearance, a few things about me. I am a 30-something who loves salted caramel hot chocolate, taking pictures of my two kids and watching TV on Sunday nights with my cute hubby. I discovered JessicaSprague.com back in 2010 when I got Oh Shoot! as a birthday present. Since then, I have dabbled in a few of Jessica’s Photoshop classes and, while I am still very much a beginner, I am totally in love with everything I have learned. This year I am making an effort to record more of our family memories by completing a Digital Project Life album. Two weeks in and so far, so good – hopefully, I can stick with it! I believe that pretty much everyone could use Photoshop for something, not just digital scrapbooking – a poster for their child’s school, a badge for their blog, décor for a party, editing photos, the list could go on and on. This year, Jessica is introducing two brand new series of classes to help even more people learn everything they can do with Photoshop. If you’re a blogger or a crafter, or know friends who are, these are a great introduction to Photoshop! The first class in each series will be in March and registration is now open. 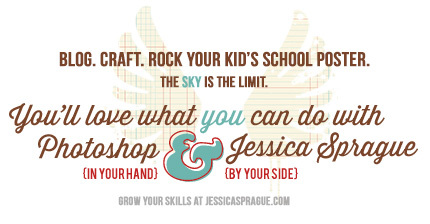 This year, Jessica will also be bringing new and improved versions of some of our most popular classes. First up, Photo Editing 1: Good to Great and Photoshop for Digital Scrapbooking, Course 1. Photo Editing begins January 21st and Digital Scrapbooking begins in March. JessicaSprague.com has an affiliate program. What does that mean? Well, when you join our Affiliate Network through Google AdSense you get access to a variety of ads (both in content and sizes) that you can display on your website or blog. When a user clicks through to our website from the ad and makes a purchase (anytime within 30 days of the first click) you get 6% of the sale! It’s that easy! Click here to get started. 2013 is going to be a great year here at JessicaSprague.com! Join us in class and on the web!